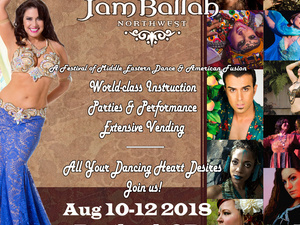 JamBallah Northwest features Middle-Eastern, American and experimental fusion and traditional world dance. The Festival offers three days of movement and lecture workshops by world-class instructors, the JamBallah Showcase evenings Night I and Night II featuring professional dance performances by the instructors and specially curated attendees, two Festival Shows featuring attendees from across the globe, as well as extensive vending with ‘alterna-chic’ workout and streetwear, handmade and imported jewelry and fabulous costumes open to the public available throughout the weekend. JamBallah Northwest is presented by Elise of Narcissa Productions LLC, partnered with the Marissa Mission, a 501c3 organization. This project is funded in part by the Regional Arts & Culture Council.